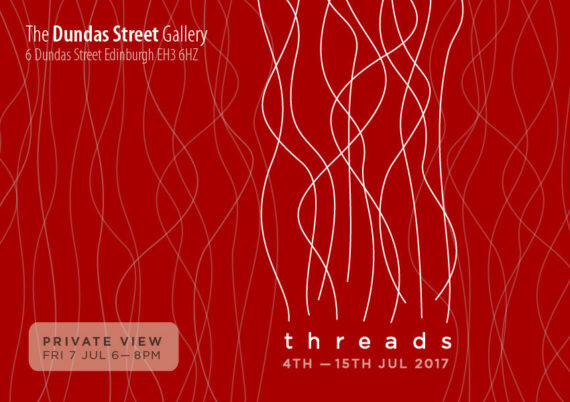 I am developing an artist led walk from the Dundas Gallery to the Royal Botanical Gardens in Edinburgh on the 9th of July which will coincide with the 'Threads' exhibition at the Dundas Gallery, which is curated by the Artists Pool. This walk will include hand made ropes which will then be knotted by participants to record their experience of the walk. As I was developing the walk in Shoreditch I was not aware that the exhibition would be travelling to Edinburgh. When I was contacted by Renee, curator at the Artists Pool about the possibility of the exhibition continuing in Edinburgh in July, I was elated as it is the location where Cecilia Vicuña wrote her poem ‘Hilo y Palabra’ (Thread and Word) in 1997. The poem was published as a limited edition print as a part of an installation at Inverleith House in the Botanical Gardens. 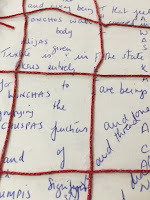 I have copied the archive describing Cecilia Vicuña’s practice below. I am starting to research the walk with a trip to Edinburgh next Tuesday, where my plan is to visit the Dundas gallery and then walk to the Royal Botanical Gardens. 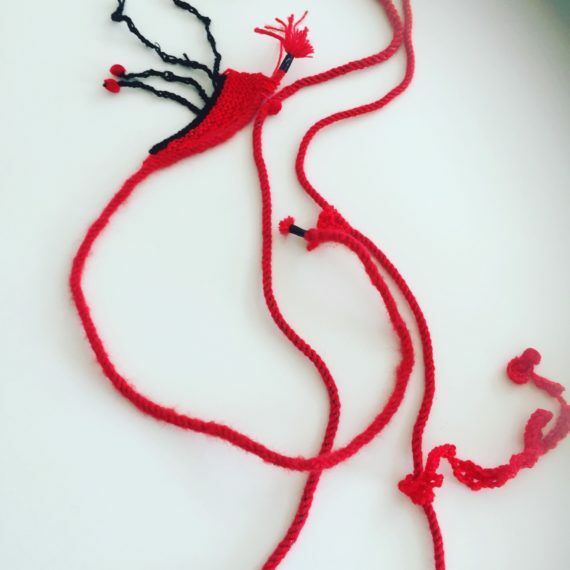 Cecilia Vicuña’s installation was titled ‘Precarious'(Precario). 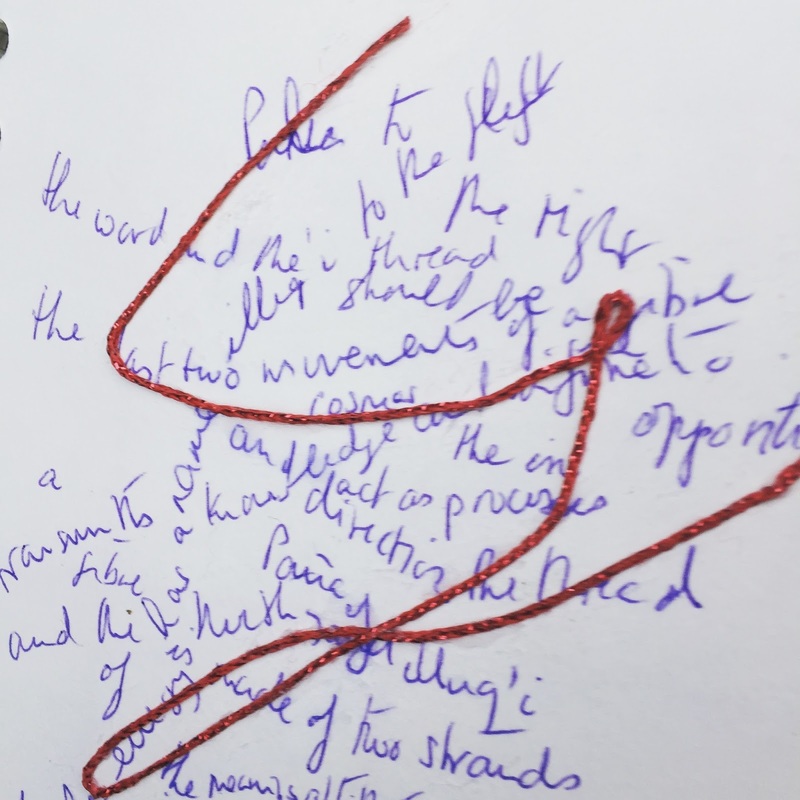 I think PRECARIO is a good working title for this walk as it expresses the fragility of the threads that bring us together and is very pertinent to both the ecological and political concerns of contemporary culture. I will update this blog with images and ideas as my research and thoughts evolve. 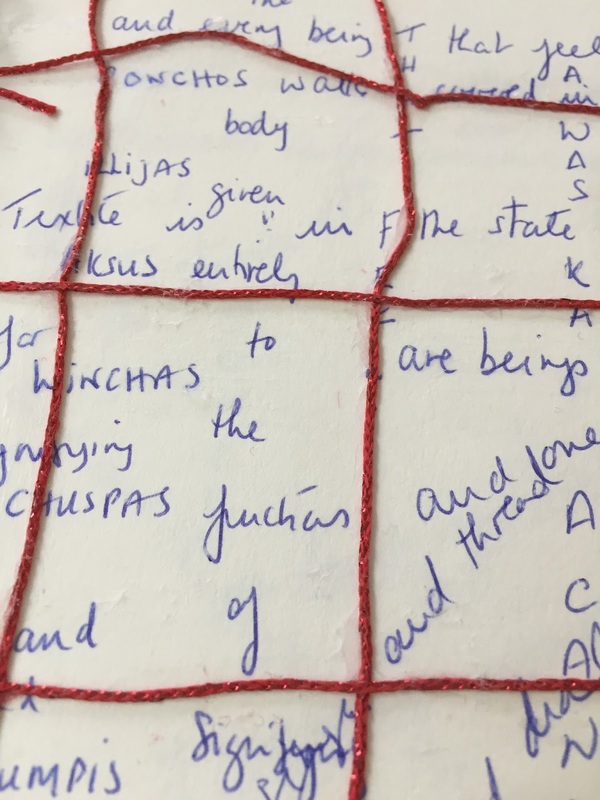 This was the first exhibition in Scotland by Cecila Vicuña, a Chilean artist, poet and film maker who works with the tradition of oral poetry, song, and weaving in the high Andes. Vicuña’s earliest recorded art work was a ritual performance, Con-con, that took place on a beach near Santiago, Chile in, in 1966. The piece involved drawing lines in the sand – a practice recalling pre-Columbian divination rituals – and arranging various found objects including stones, sticks and feathers. Another important early work exemplifying her interest in natural materials and ephemeral forms was an installation piece, Otono, 1971, for which Vicuña filled an entire gallery of the National Museum of Fine Arts in Santiago with autumn leaves. 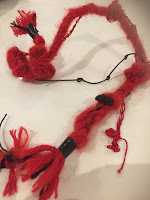 In the mid 1960s, Vicuña began making what she called “precarious” of “basturias” (bits of garbage), small assemblages of found materials such as feathers, sticks, shells, leaves, bones, and thread. * Extracts from an essay written by Lawrence Rinder, curator of the University Art Museum, Berkeley, California.